The HALOGUARD ® IR combines advanced microprocessor based digital signal processing and a highly selective and sensitive photo acoustic infrared cell to provide the newest, most sensitive system for continuous monitoring of any refrigerant gas. The HALOGUARD ® IR monitors single or multiple, local and remote locations and provides notification when gas concentration reaches preset alarm levels. Add individual, simultaneous monitoring of up to 3 different gases and up to 24 sample points by adding optional channel scanners and remote IR modules. Alarm relays and analog outputs are designed to activate remote devices or to interface with an energy management (EMS) or building automation (BAS) system. 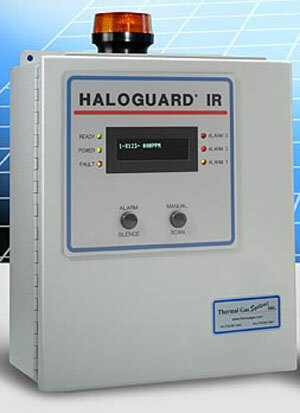 Haloguard IR is unconditionally guaranteed for one year from the date of shipment. Any device found defective in that period will be replaced free of charge.